November is Pancreatic Cancer Awareness Month, during which the world comes together to help raise awareness of this often misdiagnosed, potentially lethal disease. 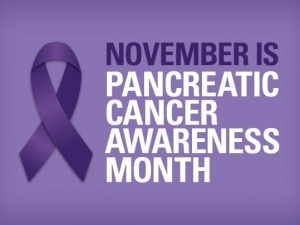 A mere 5% of patients survive Pancreatic Cancer. That’s the worst survival rate of all 22 common cancers, and with 985 people dying around the world every day, that makes it the 7th biggest killer of all cancers, and 4th and 5th in the US and UK respectively. There will be awareness events and fundraising campaigns throughout the month, but the focus is on the 17 November 2016, when charities will be hosting ’Turn it Purple’ events for World Pancreatic Cancer Day. Famous landmarks will be floodlit in purple, and everyone is encouraged to wear purple, sharing a selfie with the hashtag #InItTogether. To celebrate both Pancreatic Cancer Awareness Month and World Pancreatic Cancer Day, we’ve got some facts, figures and symptoms on pancreatic cancer, so that you can #KnowYourSymptoms and spot any issues as fast as possible. Late detection and lack of knowledge is the key reason that the survival rate has remained so low. A recent survey revealed that 60% of people know ‘almost nothing’ about the disease, despite the chilling statistics that surround it. Not only are members of the public unaware of it, but due to it’s vague symptoms, many of which are similar to other illnesses, clinicians often fail to consider it when forming a differential diagnosis, attributing the patients symptoms instead to illnesses such as Dyspepsia or IBS. Sean Duffy, the National Clinical Director for Cancer at NHS England says: “Early diagnosis of cancer is absolutely critical to improving survival,” and the small number of patients who are diagnosed with Pancreatic Cancer in time for surgery see their chances of survival increase tenfold. The longer term, five year survival rate is currently at just 5% and shockingly this figure has not improved significantly in 50 years. Our pancreas has two main functions. The first is to produce the enzymes needed to break down our food in the digestive system, and the cells which do this are called exocrine cells. The second is to produce insulin which helps break down glucose in our bloodstream and maintain healthy blood-sugar levels, and this is the responsibility of the endocrine cells. Pancreatic Cancer occurs when abnormal cells in the pancreas grow out of control, forming a tumour. 90% of pancreatic cancers occur in the exocrine cells, with tumours forming in the lining of the ducts which carry digestive juices to the intestine; these are called pancreatic ductal adenocarcinomas. Much less common are neuroendocrine tumours making up just 2-5% of tumours, and the remaining 5-8% are extremely rare forms of pancreatic cancer affecting many different parts of the pancreas. 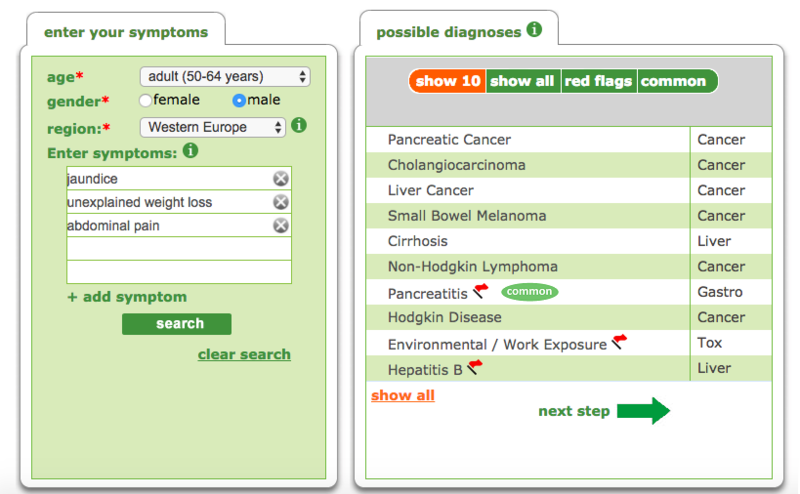 Isabel Symptom Checker, showing symptoms and diagnosis for pancreatic cancer. One rare survivor is UK-based Ali Stunt who was just one of the lucky 10% of people to be diagnosed early enough to have life-saving surgery. Ali did not fit into any of the high risk categories which cause the disease and was only 41 when diagnosed. The initial differential diagnosis which her local family doctor came up with was either Dyspepsia or Irritable Bowel Syndrome and later on, as the abdominal pain increased, another doctor suggested Pancreatitis. But her clinicians felt the amount of pain she was suffering didn’t warrant admission into hospital, and she was told she would have to wait 4 weeks for an ultrasound. Ali was able to have a scan with a private healthcare company within a couple of days, and this essentially saved her life. Following the scan which revealed cancerous cells, Ali was operated on within a few days and then endured a gruelling routine of radiotherapy and chemotherapy. 12 years on, she is living proof that, if diagnosed early enough, survival is possible. She has since dedicated her life to increasing awareness of of the symptoms of Pancreatic Cancer, via her charity, Pancreatic Cancer Action, and was instrumental in setting up the UK’s very first Pancreatic Cancer Week in 2009. She now lectures around the world on the how critical early diagnosis is, with the sole aim of increasing the very low survival rates of this little-understood but deadly disease. As is evident in Ali Stunt’s story, time is of the essence when it comes to diagnosing this disease. Many family doctors will be reticent about offering a scan (currently the only diagnostic method available), and are likely to want to test for other illnesses first. However, due to the location of the pancreas which is so close to other organs, the chances of the tumour metastasising (spreading) to other organs are extremely high. Even a delay of just a week or two can make the difference between treatable Pancreatic Cancer and a terminal illness. Taking a printout from a tried and tested Symptom Checker such as Isabel, which has been extensively validated and is being used by Clinicians around the world, and talking through these results with their Doctor will enable the patient to discuss the likelihood of a possible tumour and consequently speed up the referral process.